Zubeidat Tsarnaeva, the mother of the Boston Marathon bombing suspects Dzhokhar and Tamerlan Tsarnaev, was put on the CIA terrorist watchlist 18 months before the tragedy, US officials said on Friday. Two lawmakers revealed Zubeidat Tsarnaeva is now considered a “person of interest” in the federal investigation into the Boston attack. The lawmakers said that investigators have traveled to Dagestan, Russia, to learn more from close associates who knew the suspects’ mother. 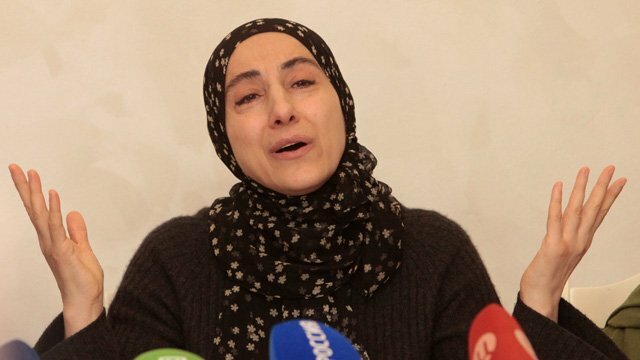 Zubeidat Tsarnaeva shot back, saying that claims that she had ties to terrorist activity were “lies and hypocrisy”. In a series of bizarre media interviews, Zubeidat Tsarnaeva has staunchly defended her sons Tamerlan and Dzhokhar Tsarnaev, who are accused of the terrorist attack on April 15 that left 3 dead and more than 260 injured. Zubeidat Tsarnaeva, 45, has sparked outrage for her incendiary comments to the media and now officials say they are probing her possible involvement in the tragedy. “She [Zubeidat Tsarnaeva]is a person of interest that we’re looking at to see if she helped radicalize her son, or had contacts with other people or other terrorist groups,” Rep. Dutch Ruppersberger, a Democrat from Maryland, who serves on the House Intelligence Committee, said on Friday. Rep. Michael McCaul, the chairman of the House Homeland Security Committee, said investigators are looking into whether the mother encouraged her son, Tamerlan Tsarnaev, to embrace Islam extremism. “The mother in my judgment has a role in his radicalization process in terms of her influence over him (and) fundamental views of Islam,” the Texas Republican told reporters. Michael McCaul added that a team of US investigators had traveled to the Chechen region to interview sources who knew the family. Unnamed officials have also reveled that the CIA asked for the Boston terror suspect and his mother to be added to a terrorist database in the fall of 2011, after the Russian government contacted the agency with concerns that both had become religious militants, according to officials briefed on the investigation. About six months earlier, the FBI investigated Tamerlan Tsarnaev and his mother, Zubeidat Tsarnaeva, also at Russia’s request, one of the officials said. The FBI found no ties to terrorism. The revelation that the FBI had also investigated Zubeidat Tsarnaeva and the CIA arranged for her to be added to the terrorism database deepened the mystery around the family. Zubeidat Tsarnaeva slammed officials who are trying to implicate her. “It’s all lies and hypocrisy,” she told The Associated Press from Dagestan. A former official of the Russian government told Congress on Friday that Cold War-era distrust may have made American officials less inclined to act on tips from Russian security services about one of the alleged Boston Marathon bombers. Andranik Migranyan, a former member of the President Council of the Russian Federation, told a House Foreign Affairs subcommittee on Friday that Russia and the United States have long viewed each other warily. Because of that, he said, American officials, in his words, “just didn’t pay enough attention” when Russian agencies asked the FBI and CIA to look into bombing suspect Tamerlan Tsarnaev. The Tsarnaevs are ethnic Chechens from southern Russia who immigrated to the Boston area in the past 11 years. This new revelation shows that both major intelligence agencies were aware of his possible terrorist ties, as it has been reported that the Russians contacted the FBI about Tamerlan Tsarnaev earlier that year. The FBI conducted an investigation and did not find he had any terror connections. Tamerlan Tsarnaev was listed on the US government’s highly classified central database of people it views as potential terrorists. But the list is so vast that authorities did not automatically keep close tabs on him, sources close to the bombing investigation said on Tuesday. The details come as it’s revealed that Russian authorities had contacted the US government repeatedly about Tamerlan Tsarnaev’s suspected ties to radical Islam, according to senators briefed on the FBI investigation. The FBI has previously said that it was only contacted once regarding a potential threat posed by Tamerlan Tsarnaev, but after an investigation, found nothing of concern. Following a closed briefing of the Senate Intelligence Committee on Tuesday, Sen. Richard Burr, a Republican representing North Carolina, said he believed that Russia alerted the United States about Tamerlan Tsarnaev in “multiple contacts”. Tamerlan Tsarnaev, 26, was killed in a police shootout early on April 19, while his younger brother Dzhokhar, 19, was captured later that day. Prosecutors say the brothers, ethnic Chechens who had been living in the United States for more than a decade, planted two bombs that exploded near the finish line of the marathon on April 15. Sources said Tamerlan Tsarnaev’s details were entered into the Terrorist Identities Datamart Environment (TIDE) list, a database maintained by the National Counterterrorism Center, because the FBI spoke to him in 2011 while investigating a Russian tip-off that he had become a follower of radical Islamists. The FBI found nothing to suggest he was an active threat, but all the same placed his name on the TIDE list. The FBI has not said what it did find about Tamerlan Tsarnaev. But the database, which holds more than half a million names, is only a repository of information on people who US authorities see as known, suspected or potential terrorists from around the world. Because of its huge size, US investigators do not routinely monitor everyone registered there, said officials familiar with the database. As of 2008, TIDE contained more than 540,000 names, although they represented about 450,000 actual people, because some of the entries are aliases or different name spellings for the same person. Fewer than 5% of the TIDE entries were US citizens or legal residents, according to a description of the database on the NCTC website. The TIDE database is one of many federal security databases set up after the September 11, 2001, attacks. The database system has been criticized in the past for being too cumbersome, especially in light of an attempted attack on a plane in 2009. Intelligence and security agencies acknowledged in Congress that they had missed clues to the Detroit “underpants bomber” Umar Farouk Abdulmutallab. Officials said after the incident that he had been listed in the TIDE database. Republican Senator Susan Collins said there were problems in sharing information ahead of the Boston bombings, too. “This is troubling to me that this many years after the attacks on our country in 2001 that we still seem to have stovepipes that prevent information from being shared effectively,” she said. Susan Collins was speaking after the FBI gave a closed-door briefing to the Senate Intelligence Committee on Tuesday, but she did not elaborate. However, in the case of Tamerlan Tsarnaev, the issue appeared to be that because he was not deemed an active threat, his name was only briefly on a list that would have triggered monitoring. Tamerlan Tsarnaev was not put on the “no-fly” list that would have banned him from boarding an airplane in the United States. Neither was he named on the Selectee List, which would have required him to be given extra security screening at airports. Another list, the Terrorist Screening Database, is a declassified version of the highly classified TIDE with fewer details about terrorist suspects. One source said Tamerlan Tsarnaev was on this list, too. After being put in the TIDE system, Tamerlan Tsarnaev’s name was entered in another database, this one maintained by the Homeland Security Department’s Customs and Border Protection bureau which is used to screen people crossing US land borders and entering at airports or by sea. Tamerlan Tsarnaev was flagged on that database when he left the United States for Russia in January 2012 but no alarm was raised, presumably because the FBI had not identified him as a threat after the interview. When he returned from Russia six months later, Tamerlan Tsarnaev had already been automatically downgraded in the border database because there was no new information that required him to continue to get extra attention. So he did not get secondary inspection on his re-entry at New York’s JFK Airport. It was unclear exactly what the procedure was for such a downgrade. Sean Joyce, deputy director of the FBI, defended the FBI’s performance in the Boston bombings at two closed hearings in Congress on Tuesday. While government agencies declined to publicly discuss how the watch list system handled Tamerlan Tsarnaev, Homeland Security Secretary Janet Napolitano disclosed some details at a separate, open hearing on immigration on Capitol Hill. “Yes, the system pinged when he was leaving the United States. By the time he returned, all investigations – the matter had been closed,” Janet Napolitano told the Senate Judiciary Committee on Tuesday.